← Ham Radio: How much does it cost? See also the Ask Dave 17 video, which discusses power for amateur radio stations. MFJ-4225MV power supply. This one's mine. See text for its good points and bad. HF radio power supplies. Why so many options? There are lots of ways to power your HF transceiver. But first, why can’t we just plug the transceiver into the wall? Well, a combination of tradition and an opportunity to tinker. Back when rigs had vacuum tubes, a radio was often sold sans power supply. Lots of hams made their own, and the manufacturers all had high-cost options available. Back then, the power supply had to supply several voltages: the filament voltage, either 6.3 or 12.6 vdc, the plate voltage, usually a few hundred volts, and various bias voltages, sometimes even negative! Tube rigs are great for nostalgia, but powering them was always an issue. This changed when separate transmitters and receivers started to merge into a single transceiver—these often had a built-in power supply. But an opportunity came when rigs became all solid-state. No high voltages were needed. The most frequent supply voltage was almost the same as the old filament voltage: 12.6 vdc. Except…well, any good rig will work within a range of supply voltages. So the standard input voltage became 13.8 vdc. Why 13.8? Because that’s an average voltage that an automobile electrical system runs at. 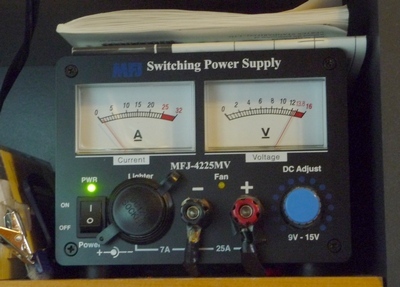 So if you purchase a stand-alone power supply, such as the MFJ-4225MV shown in the image, you’re looking at a 13.8 vdc supply, nicely matched to today’s HF radios and VHF mobiles. Okay, now here’s where all the options joust for front and center. You can actually power your rig from an automobile battery, and there are lots of hams who do this. 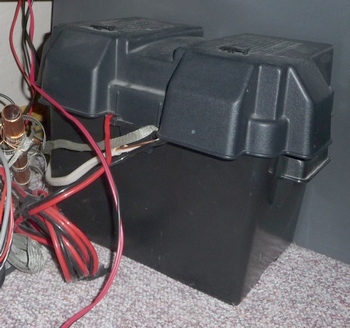 But if you’re going to get a battery just for your ham station, get at least a “marine” deep cycle battery instead of a standard automotive battery. Why? Because auto batteries are designed for lots of current for short periods of time, whereas a deep cycle battery is designed for smaller amounts of current over longer periods of time. You can purchase a suitable battery at Walmart for not very much money—I found a suitable “marine” battery for $58 + $10 core charge + tax. You can hook your radio directly to the battery. My experience is that these batteries have a useful life of about three years and then must be replaced. I just replaced mine. You do, however, need a way to charge that battery. You may have an old charger laying around, but what you really want is a smart one because, after all, this battery is going to be in your house and you don’t want lots of acid haze everywhere. Walmart’s website is really hard to use—can’t find anything—but it looks like you can get a simple battery maintainer for about $20 at the low end. Remember, most of the time your rig draws hardly any current, so keeping it charged is not hard. Now, you need one more thing: a suitable box to put that battery in. You need it for several reasons, not the least of which is safety. While 12vdc won’t cause harm if you happen to touch both terminals at the same time, if you happen to put a piece of metal across the two contacts at the same time, that battery can release several hundred amps all at once, which means over a kilowatt of power, which will pretty much vaporize the metal, not to mention the fire hazard. Plus, even though it might be a maintenance-free battery, it still emits some acid haze, which you don’t want getting on anything. Okay, looking at cost here, we’re up to about $120 or more, including the battery, charger, and box. Don’t forget to disconnect the charger while you’re using the battery, because chargers often create RF noise that you’ll hear in your receiver. Oh…don’t forget to reconnect the charger when you’re done. Don’t throw your back out getting that very heavy battery into place. Hmmm…lots of work. Now here’s the rub. For that same $100, you can purchase a standard power supply built especially for radio use, meaning you won’t hear them in your receiver. The picture at the top of this post shows one I have. It’s an MFJ-4225MV Switching Power Supply that plugs into the wall (120 vac) and has an output that’s adjustable from 9 vdc to 15 vdc. It has a detent in the voltage knob for 13.8 vdc. I can’t discern any RF hash—very clean power supply. I use it to power my APRS station, consisting of an old AEA (now Timewave) DSP-232 and an ICOM IC-2100 2-meter mobile rig. My only issue with the MFJ-4225MV is the fan noise. The QST review said the noise was moderate. Ha! It sounds more like an airplane taking off. So I neutered the fan so it’s very quiet. You’ll note in the picture I’m careful to keep the sides open to the air because that’s where the air vents are. I really, really wish it had a temperature-sensitive fan. If I had to put this into service for my main HF station, I’d turn it off when not in use and would use headphones when operating. I’ll mention here that power supplies are something you can pay as much or as little for as you want. You definitely want a power supply designed for HF radios! A supply you might find at a retail chain may create lots of RF hash which you’ll hear in your receiver. That noise interferes with your ability to hear the other station’s signal. One place to go for them is Ham Radio Outlet—they have quite a few to choose from. Essentially, you want a 13.8 vdc power supply of at least 20 amps, because that’s what your 100-watt HF rig will draw on transmit. You can buy them with fancy meters (like the MFJ-4225MV) or a simple black box. Most power supplies these days are of the switching type (the modern way), but the old linear (energy-inefficient) supplies are still available and work fine, though they’re rather heavy (not nearly as heavy as that battery, though!). You can tell what I recommend: do what works for you. Overall, I’d say go the commercial power supply route because it’s about the same price, will last for a long time (rigs come and go, but power supplies have a habit of sticking around), it’s safer, and it’s a lot less trouble. One very last comment. Do not attach your 13.8 vdc power supply to a battery which is then attached to your rig. Yes, this will give you a power supply in the event of utility power failure. BUT…the float voltage for a flooded lead-acid battery is 13.3 volts. Keeping it on 13.8 vdc will eventually cause damage to the battery and greatly shorten its life. So don’t use your power supply as a battery charger! This entry was posted in Ham Radio blog entries and tagged batteries for HF radio, ham radio, MFJ-4225MV, power supply. Bookmark the permalink. In response to Sam Natole; I have a Kenwood TM-V71A which also would only work with the car on (hybrid so not necessarily “running”) and would die and restart when trying to transmit. I had heavy gauge wire running directly to the battery. Something about the Kenwoods I guess. I swapped it with an Icom of similar specs and now use the Kenwood as a base with a Jetstream 13.8V supply. Check the owner’s manual for the linear. How big of a power supply to run a 100 watt linear. Being ssb @ 200 output. my 281a Ken wood wont transmit unless my truck is running. Any comments? correct. Make sure it’s a 12v power supply. Not a computer 5v supply. OK Dave, so I am new to HAM and I have decided for cost purposes to use a mobile unit hooked to a 30 amp power supply. I believe all I need to do is take the wires from the mobile unit (black and red) and hook them to the color-coordinated black and red posts on the 30 amp power supply and then plug the power supply unit into the wall and presto… power. Correct? Check me if I am wrong here. It’s okay wherever it works without any interference from the power supply. Should my AM/FM rig be a certain distance from my power supply, or is it okay next to it as it is now? I have no CB expertise, so can’t really comment. The Walmart “Marine” battery isn’t a true deep cycle battery, but can be used to power a radio. I’ve done it a number of times. In your Pick Up or traveling long distance, if you aren’t thrilled with wiring to your truck battery, or prefer to use a Marine Battery in a rented RV, is the Marine Battery that’s recommended here a wise direction for usage with whichever CB Radio you purchased?